In 2011 CRRC conducted a survey on Volunteering and Civic Participation in Georgia. A part of this survey aimed at exploring relationships between neighbours. The results indicate that the relationships between neighbours in Georgia can be a promising starting point for building social capital and achieving improved housing conditions through collaboration. The data show that just over a third of adults in Georgia are familiar with more than ten families in their neighbourhoods and most Georgians interact with their neighbours every day. A considerable amount of Georgians also report being involved in organized activities in which the person who takes on the role of mobilizer is usually respected by others. One challenge identified by this research is a lack of communication between neighbours regarding common problems and concerns. The data from the civic participation and volunteerism survey suggest that Georgians not only know many families in their neighbourhood but also maintain frequent contact with them; half of Georgians know all families in their neighbourhood and 37% know more than ten families. Only 12% of Georgians say they know less than 10 families in their neighbourhood. CRRC also asked Georgians about how often they talk to their neighbours. As it turned out, 78% talk to their neighbours every day and 18% at least once a week. However, in spite of frequent conversations, common problems are less discussed among neighbours which may prevent collaboration to fix important problems in their neighbourhood. 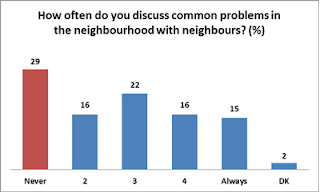 The data show that only 15% always discuss common problems with their neighbours and 29% never do so. 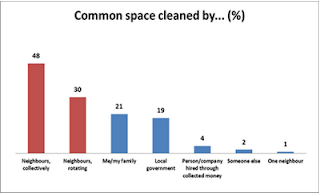 CRRC data also show that there is some degree of collaboration between neighbours in terms of cleaning common space. 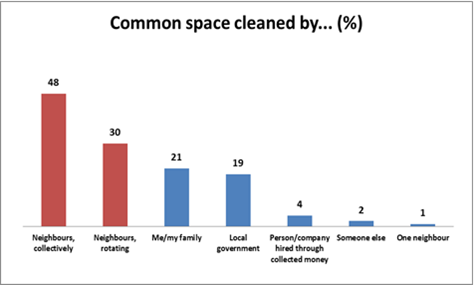 71% of Georgians say that common space in their neighbourhood gets regularly cleaned and 78% say this is done by neighbours either collectively or on a rotating basis. This collaboration is a promising practice that has the potential to expand into other aspects of housing, such as improving the appearance of houses and yards in Georgia. Note: This question was asked to 71% of respondents who said that common space in their neighbourhood gets regularly cleaned. How exactly does such collaboration work in Georgian neighbourhoods? Just over half of Georgians (52%) say there is a person in their neighbourhood who will organize people or solve a problem him/herself. Moreover, in about half of the cases (56%) this person is elected by other neighbours to handle neighbourhood problems. Most importantly, Georgians have a positive attitude towards these community organizers. Out of the 52% of Georgians who indicate that such a person exists, 81% of them say the majority of neighbours have a positive attitude towards this neighbour. 17% say that they have a neutral attitude towards this neighbour and only 1% thinks that the majority of neighbours have a negative attitude towards this person. The survey also asked Georgians about their attitude towards people who collect money in their neighbourhood to fix problems. 77% of Georgians respect these people because they spend energy to solve problems which concern everyone. In contrast, only 3% of Georgians say that they are suspicious of people who collect money in their neighbourhood because they make a profit out of it. Neighbours who collaborate are more likely to keep their houses and yards in good repair. This post has showed that many Georgian neighbourhoods have quite close-knit groups with a potential for improved collaboration. While lack of communication about problems that affect everyone remains a hindrance to collaboration, CRRC data suggest that those who take the initiative to organize and help in solving common problems are respected by others.